One of Florida’s best kept secrets is right here in Perdido Key. Perdido Key, meaning “Lost Key”, is an unincorporated community with a narrow strip of white, sandy beaches stretching about 16 miles located between Orange Beach, AL and Pensacola, FL. Perdido Key was discovered by the Spanish in 1693. The Gulf Coast Native Americans were the first to occupy the island. You will find peace and tranquility in Perdido Key. What you will NOT find are over crowded beaches and over developed land. 60% of the Perdido Key area is protected by state and federal parks. A lot of people don’t know Perdido Key is home to the endangered Beach Mouse. This tiny white and light grey mouse with big ears is slowly making a comeback. In the 1990’s there were less than 40 mice living in the world right here in Perdido Key. Currently, with help and support, the mice population is up to around 500. A major purpose they serve here is spreading vegetation in the dunes. They eat the sea oat seeds dropping them along the way causing more to grow. Perdido Key is a popular place for the endangered sea turtle. Sea turtles are drawn to this area looking for a safe, secluded place to lay their eggs. Tropical birds traveling to North America to breed, such as Warblers and Cedar Waxwings, will stop at Perdido Key to rest and feed on the island. 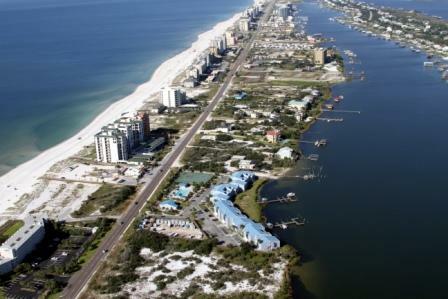 The narrow strip of Perdido Key Island is located between the Gulf of Mexico and Ole River. Ole River is like the dolphin’s playground. It’s likely you will see them playing and jumping. Looking over Ole River you can see the private Ono Island. Gulf Islands National Seashore, AKA Johnson Beach, is located on the East end of Perdido Key with the site of Fort McRee at the Eastern tip of Johnson. Travelers choose Perdido Key for many reasons. With Perdido Key being centrally located to Pensacola, FL and Gulf Shores, AL vacationers experience the laid back beach life focusing on family and memories yet still close enough to surrounding towns to get in the action and excitement when wanted. The Alabama and Florida Gulf Beaches are popular vacation spots year round. Perdido Key is perfect for Snowbird season. Our winter guest come from all over to escape the cold and snow. Trade in that cold snow for warm sand and enjoy our sunny paradise, Perdido Key. Whatever your reason for coming, just to slow down and relax, family time, girls getaway, golf trip, escaping a snowy winter, we invite you to make memories with us here in Florida’s Perdido Key. ~Your Friend at the Beach!